When did you first become involved in outdoor activities? Where did you live and how did you become interested? I grew up in the Catskill Mountains of New York and my family spent most free time outside doing anything and everything from hiking to canoeing. That love of the outdoors, instilled from a very young age, has stuck with me to this day. There’s something pure and beautiful about being outdoors and surrounded by nature. How did your activities evolve? Who did you do them with… alone or with others? I have always been fortunate to have an older brother with whom I am very close, and we have always done a tremendous amount outdoors together, as well as with the rest of my family and friends. When we were very young, we would explore the woods, play in the stream, and make bike paths in the woods. As we got older, we tended to drift toward more adventurous outdoor pursuits. Now we seem to have found our calling with rock and ice climbing. Can you give a brief description of one or more of the places you enjoyed? Why was it (or why were they) special to you? One of the places that holds a special place in my heart is the Shawangunk Ridge, more commonly called the Gunks. 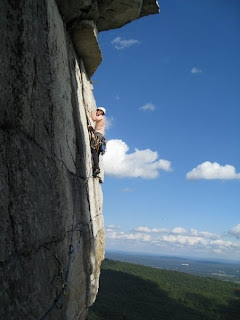 The Gunks are a series of exposed cliff faces about 250’ tall on top of a ridge right outside of New Paltz, in the Hudson Valley of New York. It’s one of the best rock climbing destinations in the world, as well as being home to many hiking trails and beautiful streams. As you’re climbing, you look down across the beautiful Hudson Valley and old farms. Since you’re already climbing on the top of a ridge, as soon as you set off the ground it is as if you’re high above the ground, up amidst the birds. There are always many Turkey Vultures swarming, and you often see Peregrine Falcons swooping by at eye level. I learned to rock climb there with my brother and friends from college, and I continue to spend a great deal of time there each year. Did you become involved in environmental activities in college? If so, what did you do? In college, I focused mostly on ecology research and understanding ecosystems. I was most interested in high elevation ecosystems, generally the top portion of mountains. Those high elevation ecosystems are some of the most interesting, but also the most fragile. In fact, they are under the greatest threat from climate change. Many of the animal and wildlife species that have carved out a precarious existence in the harsh and very specific conditions of high elevation ecosystems are at risk of extinction with climate change. What happens it that as the climate warms, the harsh conditions near the top of mountains becomes less harsh, and the more aggressive species that thrive at lower elevations can move farther up the mountain, stifling and eventually destroying the fragile high elevation inhabitants. I understand that you were one of the organizers of Power Shift. What is the vision of Power Shift? Who got the original idea for it? What were its accomplishments? The idea of Power Shift is to unify and empower the youth climate movement. It’s run by a coalition of many big environmental groups, Energy Action Coalition, which is now the overarching umbrella for the youth environmental movement. This past Power Shift brought 10,000 youth from all around the country together for four days of grassroots organizing training, campaign planning, inspiration, and action. It served as the launching ground for hundreds of local campaigns run by trained, motivated youth activists. What is your work now with Frack Action? I’m working with Frack Action to protect New York State from the grave threat of fracking for natural gas. Natural gas threatens New York’s health, environment, and economy. It’s a dangerous form of extreme fossil fuel extraction that has a long history of water contamination, air pollution, and devastating communities. We work on a mix of grassroots organizing, communications work, and advocacy to spread the truth about fracking and mobilize people to take a stand against it. Do you view your current job/activism as a natural outgrowth of your love of the outdoors? In what ways? It is natural that people who love the outdoors want to take action to protect it. People like me have a great appreciation for keeping the environment healthy, protecting the beauty of nature, and not destroying that for our future and future generations. What do you see as your next step? Please include your dream job, if possible! I’m definitely going to continue working to stop fracking in New York State. At some point I will go to grad school in a PhD program with an environmental focus. Sam Hendren grew up on a dairy farm in central Ohio and has been farming in the Champlain Valley of New York for over a decade. Clover Mead Farm depends on certified organic Jerseys and a functional farmstead. Wanting a flexible operation that invigorated the local economy but didn’t demand the doubling of his herd, Sam started making cheese twelve years ago. Since then, Clover Mead Farm has offered a variety of organic cheeses including Couronne, for which Sam won a bronze medal competing against 14 countries and 120 entrants in the International Cheese Competition in Trinity, England. Using a tradition dating back to the French settlements in his area, Sam has been garnering accolades for his cheese. He and his wife Denise have been featured in Gourmet magazine and Three Farms, a film showcasing innovative farms in the Adirondacks. Food & Water Watch, a national consumer advocacy group, has launched a campaign for a better food system in Albany. Consumers need access to safe food from sustainable agricultural methods. Farmers who’ve farmed for generations are being forced to sell their farms or are struggling to compete against the big agribusinesses that have come to dominate the food system. This is not the way our food system has always been, and it is not the way it has to be. 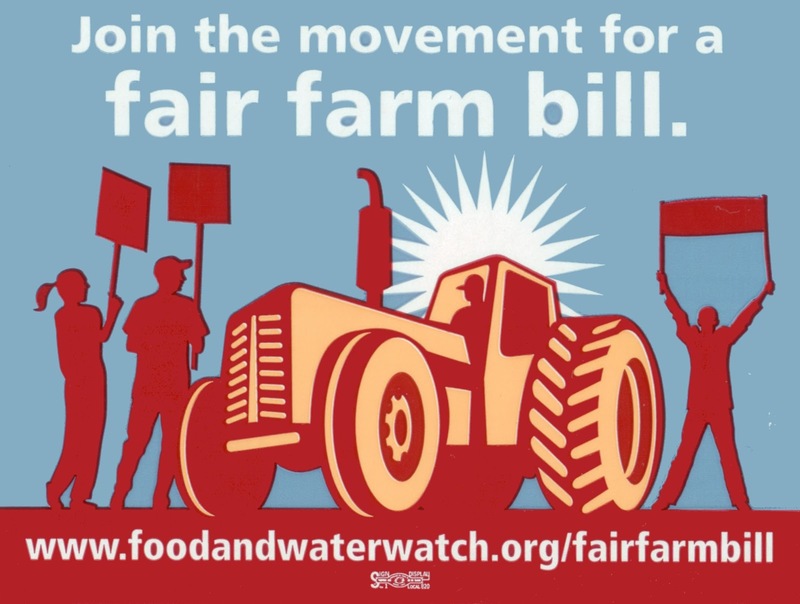 Food & Water Watch’s Fair Farm Bill campaign is working to level the playing field to support small and mid-sized farmers so they can thrive for generations to come. The Farm Bill, the most important piece of national legislation that determines how food reaches our plates, is up for review. 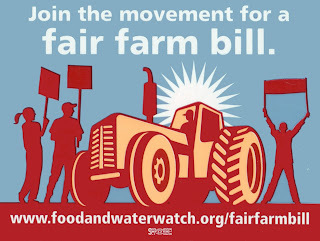 This happens every five years, and because New York’s US Senator Gillibrand is on the agriculture committee, she’s making decisions right now about what protections the bill will include for small farmers, consumers, and the environment. All New Yorkers have a stake in this issue. Our ongoing campaign is showing Senator Gillibrand that across the state, New Yorkers want to see new policies to increase competition in the food system so that small farmers can compete. You can get involved with our call-in campaign. As a constituent of Senator Gillibrand, you can call today and show her that you want her to be a leader on this issue and a voice for change. We can create a healthy food system for everyone. You can use either of these numbers: 518-431-0120 or 212-688-6262. Here is a suggested script: "Hi. I'm __________, a constituent in ___________NY. I strongly believe that we need to level the playing field for all family farmers and consumers, so I'm calling to encourage Sen. Gillibrand to introduce a competition title, or section, in the upcoming farm bill, so smaller farmers can compete and are treated fairly. Thank you." Thomas Friedman is the influential Pulitzer Prize-winning columnist at the New York Times and the author of four books. In these short videos he talks about the crucial importance of sustainability both in the natural world and in the marketplace. You can find more information at http://www.eco-rescue.info. In connection with the new Environmental Prize from Big Mind Learning, we are launching a blog to showcase a variety of individuals working tirelessly to enrich or protect our environment. We celebrate their efforts. We thank them wholeheartedly. We support them whenever we can. In some cases these people or organizations are nurturing and protecting delicate ecosystems, forest land or farmland, animals or sustainable energy, urban gardens and architecture. In other cases people have explained in their blog posts why they love wildlife and wilderness experiences such as rock climbing, ice climbing, or fishing. In art, poetry, photography, science and technology, they are making their mark, inspiring the rest of us, and encouraging our involvement. We hope that their example will re-charge the community to participate with them and enjoy the fruits of their labor. They are changing the face of the earth as we race to save our planet. We hope that high school juniors and seniors will enter the Big Mind Learning contest for the Environmental Prize and let us know what work they have done in any area. We want to celebrate them. Please help us spread the word!